King crabs are the largest commercially harvested crab, reaching up to 6 feet from leg tip to leg tip and weighting up to 10 lbs. They have spiny red shells, though closely related species also come in blue and brown. King crabs have six long walking legs, one large claw (for catching and killing prey) and one small claw (for moving prey to its mouth). The body meat is flakier than the leg meat, though it is all sweet, moist and rich. The highest quality meat comes from the upper section of the walking legs, and is often labeled as fancy meat. King crab is almost always pre-cooked and sold frozen. Red king crab are found throughout British Columbia and southeast Alaska, across the Bering Sea to Russia and northern Japan. 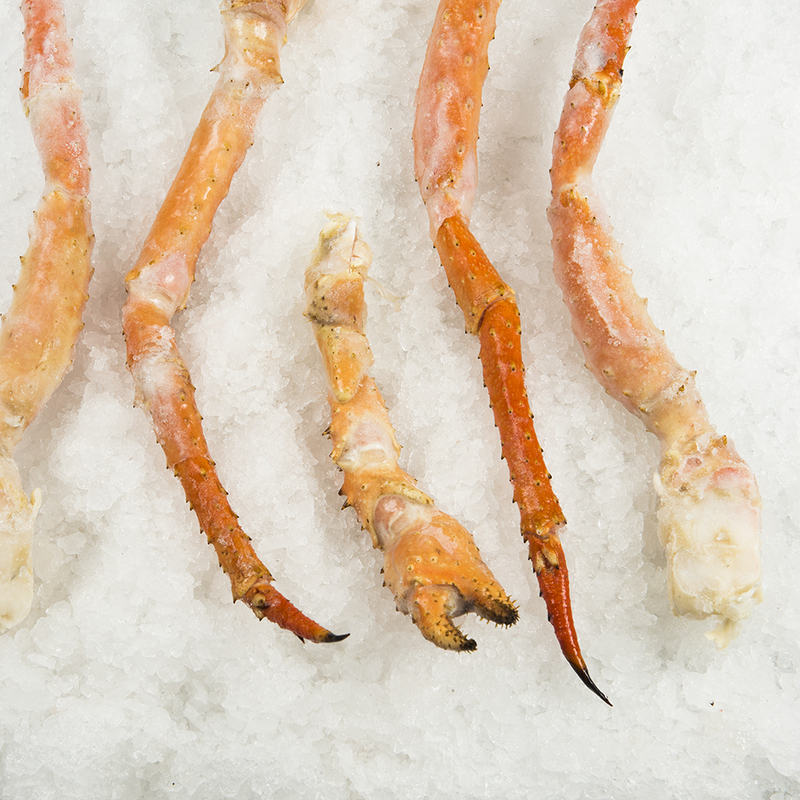 Almost half of the king crab sold in the U.S. is imported from Russia. Good management of king crab from Alaska and Canada has made the major fisheries sustainable. The populations are closely monitored and are healthy or rebuilding to a healthy level. Annual harvest quotas are set according to yearly status surveys of the population. Regulations require that all female crabs and small male crabs be returned to the water. King crabs are harvested with very large pots that are set on muddy seafloor, which is a very resilient seafloor habitat. Bycatch is naturally low. Populations of red king crab in some areas were overfished in the mid to late 1900s and have not recovered, but these populations are not harvested. Twenty plus legs per ten pounds of product.